The Law on Special Administrative-Economic Zones (SAEZs) will continue to be discussed at the fifth session of the 12th National Assembly. The law is expected to create a breakthrough to attract investment. The proposed special administrative economic zones include Vân Đồn in the northern province of Quảng Ninh, Bắc Vân Phong in the central coastal province of Khánh Hòa and Phú Quốc in the southern province of Kiên Giang. 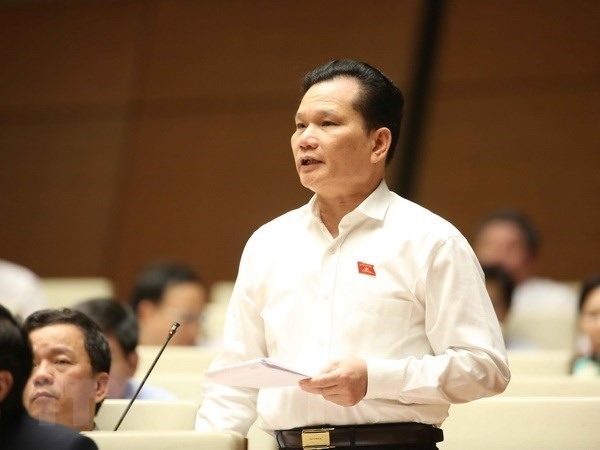 On the sidelines of the NA session on Tuesday, deputy Bùi Sỹ Lợi from the central province of Thanh Hóa speaks to reporters about the issues related to the special zones. What do you think about the Government’s plan to build special administrative economic zones? The special administrative economic zones that the Government is proposing and the National Assembly will discuss are located in three regions to explore their own advantages. Construction of the SAEZs is the policy of the Party, the State and the National Assembly. We want to build the special zones to create a driving force for socio-economic development. Special administrative economic zones in Quảng Ninh, Khánh Hòa and Kiên Giang are the places to establish breakthrough policies and mechanisms. I think the construction of the SAEZs is very important. There are some concerns about the empowerment of autonomy for the special administrative economic zones. What is your opinion? Called special administrative economic units, the zones must have the right of self-decision making on issues that might not yet be regulated by laws but are not against the Constitution. Many people worry that giving autonomy to the zones’ leaders would lead to abuses of power, so we must have sanctions to combine rights with responsibilities. Higher authority means greater responsibility. If we do not do that, then how can we develop the country? I hope this NA will discuss and finalise the law so that we can build the special zones and facilitate the country’s development. This is also the desire of the localities. The planning of three SAEZs has caused land prices in these areas to rise rapidly. How can the Government control the situation? This is a matter of economic rules. People will seek investment to make profit in a place where they see a lot of business potential. However, authorities must manage and implement policies properly. The Government must not let some people abuse the policy and create vested interests. Violations must be handled strictly. Once we establish a special economic zone, it is good to have investors come there and develop projects. However, we need to study policies carefully, especially those related to land to prevent profiteering. According to the project of establishing the three SAEZs, the mobilised capital is estimated to amount to more than VNĐ1.5 quadrillion, how could the State budget regain the investment capital while the Government offers many preferential tax policies for the implementation of projects in the zones? Actually, capital to be invested in building the zones is not completely sourced from the State budget. The State capital is just a primer, a motivating force and it must be recovered. It is important that the State calls for private investors and creates attractive mechanisms and motivation for investors to join the process of socio-economic development. To avoid tax evasion, authorities must appraise projects, assess their impacts and thoroughly consider their effectiveness before granting licences. What are the social issues that will arise when developing SAEZs? Not only in special economic zones, but also in big cities, social problems such as prostitution and drug abuse can occur. The important thing is that the authorities have to foresee the problems and issue policies and mechanisms to curb the social evils. We cannot compromise social issues to focus on economic development. This is a matter of concern.